Social media drives a huge amount of communication between businesses and their customers. While healthcare has a lot more to be concerned with when posting on social media the advantages for doing so can be immense. Your business should have a HIPAA social media policy regardless of what stance you take on the use of social media in and by your business. Our guest, Janet Kennedy of Get Social Health, devotes a podcast to the use of social media in healthcare. We are excited to have her on the show today. [6:10] The challenge for a smaller business is having the resources to manage social media just like anything else for small businesses. There just aren’t enough resources to go around. However, the use of social media is going to happen in your business one way or another. You really need a plan for dealing with it to both protect and properly promote your services. Generally, you end up with someone who is very young in charge of the social media strategy because they “understand” social media. Or, you get the administrator who has been in healthcare for a decade or more. Either way, that person ends up in the role of the digital marketing expert in your business. Get Social Health is designed to help you build a social media plan, not so much how to actually use social media itself. @GetSocialHealth says: If you are doing social media begrudgingly people will know it and sense it. [7:55] As we say here at HMWH you need written policies to manage everything with privacy and security. 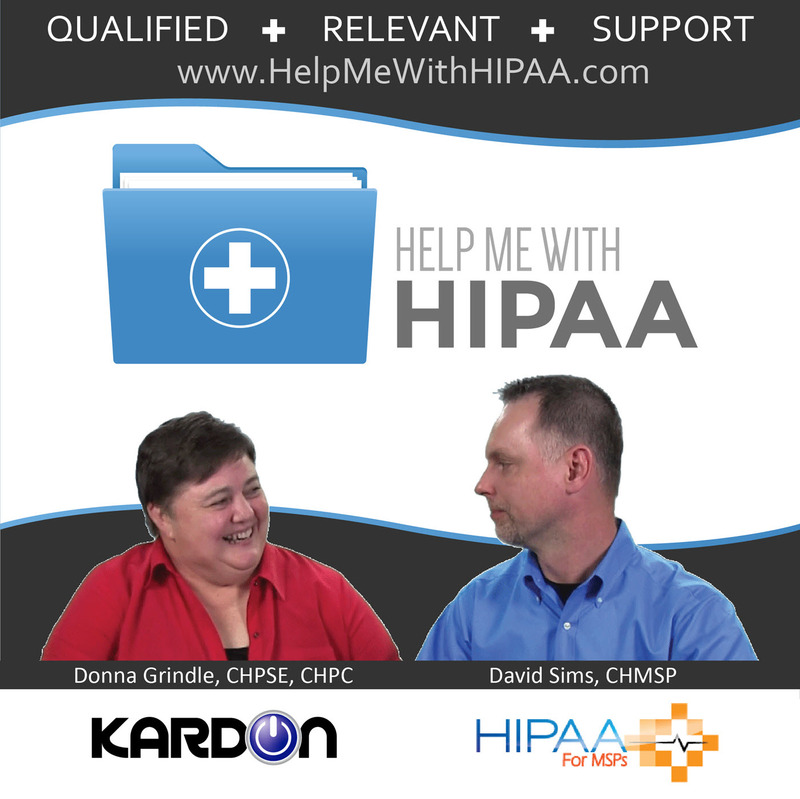 You definitely need to address privacy and security in your HIPAA social media policies. Don’t go down the path of building a social media marketing plan without putting the framework for privacy and security in place first. [9:50] Facebook has a new feature that will let you private message them in your news feed. This allows you to at least respond to comments on your page from patients. But, still you just tell them to contact you via phone or a portal. You can’t respond publicly to patients under HIPAA privacy rules. [11:35] Janet mentions the same note as we do – none of us are lawyers. Having a lawyer review these HIPAA social media policies is a pretty good idea. Don’t get too specific in your policies, though, because new tools and features are constantly emerging. If you write specific policies you will have to update them frequently. Official policy approved by the lawyers that sets the overall organization’s framework for social media activity. It should include the plan for responding to social media activity outside the policy guidelines as well as the guidelines themselves. A summary page for the workforce to use for reference. It is designed to just give them what they can do at work and what they have to worry about using their own social media accounts. Post a policy on your social media profiles that links to your patient privacy guidelines. It is also helpful to post it in a lobby or waiting room area, as well. [15:07] Do I need to be on all platforms? Start with what is your marketing plan. Why do you want to be one social media and how would you actually use it to your benefit? You need to be there because your patients are there more than anything. Do an audit of your own business profiles you currently have in place. Also, check what your competitors are doing. Then, audit your own business profiles to see if your business is already out there but not being updated. You might have profiles that exist with reviews on it and you don’t even know it. Your website needs to be up to date and mobile optimized because it should be the center of your online life. All your social media profiles should link back to it. Make sure the ultimate goal is to drive traffic back to your website. When you are posting on your social media sites, include helpful information about the services your patients will be looking for online. Promote what you know and can share with the patients. Content is always key. [25:45] What happens when social media isn’t controlled properly? Generally, problems are a result of ignorance or lack of kindness. If the patient recognizes themselves, then you have a problem. No one should be able to recognize themselves. Make sure you have a serious discussion about the use of photos and video taken with smartphones. The whole idea of your HIPAA social media policies is to prevent problems before they happen in any way possible. You need to make sure that all your workforce understands what is appropriate when it comes to posting things even on their own page.